prayer for the city and region on Christmas Eve. A light for every street is a project of Hope - The Next Chapter, with One Voice (Hull), Kings Breakfast and Try Praying as a result from a prompting from God for the whole city to pray for Hull. 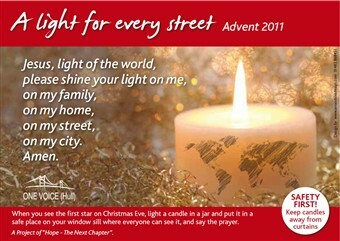 People came to a stall in St Stephen’s Shopping Centre, each thursday evening during advent, marked their street on a map, collected a professionally designed and printed prayer card and candle. Then, as the first star appeared out on Christmas Eve, each lit the candle and as they placed it in a window, said the short prayer – ‘Jesus, Light of the world, please shine your light on me, on my family, on my home, on my street, on my city. Amen’. The candle light on Christmas eve, resonating the star over the manger and an old Polish custom, added a new ‘tradition’ to local life and brought a focus on God back to a consumer hijacked season. the 'greater things that are yet to come', as they continue to pray and expect. I put light in my window and prayed for my street and at my church but I did not collect from the stall so I was thinking I imagine many others also did their own, very positive for our city! How to open documents windows 10,guys you are not alone here,many users facing this problem,try the diff option and function to open file folder http://documentswindows10.com here the all possible solution,thanks for provide this method,then read more about for this issue. Music festivals might be a playground for the young, but church people of all ages support the Solace Solace2 compressedteam. A massive army of bakers are hard at work providing the cakes. There is no doubt it is a good idea and good for society & as I think as a writer of it should be done everywhere.